I hope you all had a wonderful Christmas weekend full of love, excitement, delicious food, remembrance of what really matters in life, and thankfulness for all of God’s wonderful gifts. Today is a very cozy day at the Jeffords’ home. My husband, Dan, has almost two weeks of leave from his duties with the Air Force, so we’re enjoying every moment of this much needed break after the last (highly intense) 8 months. This was our first Christmas away from Ohio (where my family lives) so it was different, but so wonderful. West Texas isn’t exactly a winder wonderland, and there were no huge, crazy family dinner, but it was also our first year having Christmas with a two year old which is very exciting and oh-so much fun. I hope you are having a wonderful winter day wherever you are! 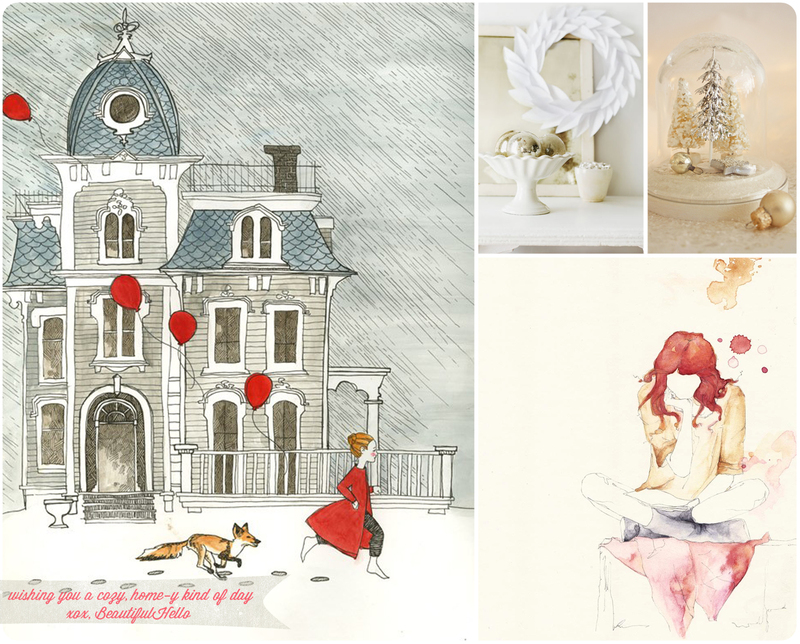 I love this little collection of cozy, sweet, and home-y pieces of artwork. They are each so charming and cheerful in their own way. Enjoy! Awww… the Illustration by Maia Larkin is adorable.